Apollo FG is the product of Mark Finlay and his desire to make a gi that will actually fit thinner/leaner athletes. As anyone that’s read my reviews knows I’m a tall and lean guy myself and the reason I started to really get interested in gis is because it was so hard to find out that actually fit me. The Omega series is a heavy-duty 550g gold weave jacket with 9.5 oz ripstop fabric. The Omega is available in white, black and blue. The gi has regular and slim sizes and most important of all you can have it for $120 (which includes shipping). The kimono consists of a 550gm gold weave jacket and 9.5oz ripstop pants. The production gi is the 3rd iteration of the model; previous versions didn’t make it past Apollo’s testing process. The seams are reinforced and triple stitched at stress points, there are enough belt loops (four), and extra reinforcement at the armpits, gusset, and skirt slits. The stitching of the jacket and pants is even throughout with no loose threads and minimal over-stitching. The collar’s thickness and rigidity are a definite plus when defending chokes and as an added bonus the lapel is covered in ripstop. The interior of the cuffs are also trimmed with ripstop on the inside. The skirt slit is trimmed in red and there is satin tape at the base of gi that says “SWEЛT MORE IN TRЛINING ● BLEED LESS IN BЛTTLE”. If you’ve ever worn a gold weave jacket then you know what to expect. The fabric is sturdy, heavy and built to take a lot of abuse. Think of it as your BJJ armor. There are two identical pieces of embroidery on the shoulders. They’re 3.75” diameter circles that have the company name and logo on them with some Greek-inspired pattern surrounding an octopus. The embroidery is securely attached to the gi and is not removable. There is a small patch at the base of the lapel that serves as the brand and model identification. There is an “Ω” embroidered in yellow on the right side of the skirt and finally “APOLLO” has been embroidered at the base of the skirt on the back of the jacket. There was some deterioration of second O in APOLLO during testing. The pants are very straightforward they have an “Ω” with an “А” inside of it embroidered in yellow on the left upper thigh on the pants. Red is used for the stitching, belt loops and the trim of the side slits. The knee reinforcement extends all the way to the cuff and finally the pants use a cord drawstring. While testing this gi I’ve noticed a few things. I really like the ripstop pants and I’ve worn them for NoGi training more than a few times. They fit well and are cut slimmer than some of my other “slim” gi pants. The ripstop is very comfortable and doesn’t bind while rolling. For the jacket I’ve had more than one partner comment that it’s difficult to establish grips and the ripstop on the collar does actually make a difference. It’s warmer than other weaves but since it’s winter that works out just fine. The overall cut of the jacket has definitely been changed to take into account the body shape of the thinner athlete. The more I wore it the more that I liked and I found myself using it quite a bit. This is the first slimcut gold weave gi that I’ve reviewed and it’s nice to have something other than pearl and crystal weave for rolling. This is also one of the least expensive gold weaves I’ve ever seen. For another review (this time of the white model) check out Jiu Jitsu Sweep’s review here. Aesthetically I think that this gi will be somewhat polarizing. One of my training partners loved it and the blue model definitely stands out. For me personally, the performance and the cut of the gi is the most important thing and in that respect it did a great job. As a side note the other colors (black and white) use the same cut, embroidery and patches. As I reread this review before posting I feel like I gave this impression that this isn’t a quality product. And while it had some deterioration of the embroidery on the back of the gi the kimono itself is holding up very well and the stitching looks as good now as it did when I first got it. I read thru the few reviews I could find and no one else mentioning this issue in their reviews so it may very well be that I just had a bit of bad luck. 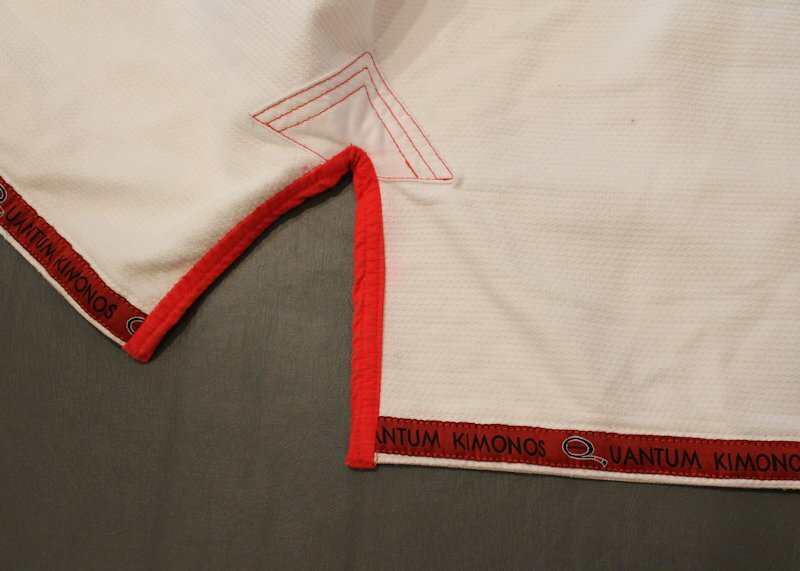 The cut, weave and stitching are all very solid and the gi is priced to sell. The only other gold weave of this quality and price is the Newaza Nation gi, which is no longer made and didn’t have the slim options that the Omega has. The Omega is currently selling for $120.00 (white) or $125.00 (Blue or Black) which includes shipping. This is a very good price on a gold weave gi or any gi for that matter. Don’t forget to take a minute to check them out on Facebook and their website.